Sales of e-books appear to have reached their peak, according to Neil Irwin. He reckons that most people who were going to switch from paper to e-books have done so by now. 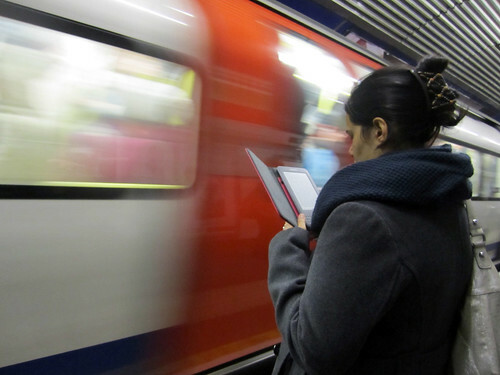 We always knew that e-books and regular books could share people’s attention. An UCLA researcher has used a text analysis of over 1 million books from the past 200 years to discover how American society has changed through language, as society has become more urbanized and (supposedly) more individualistic. We wonder how much the way that people talk about transport has changed as well. EL James’ 50 Shades Freed is the most likely book to be left in Travelodge hotel rooms. Book swapping has come to the Shanghai underground. On the city’s Metro Line 2, commuters can pick up books at one station, and then return them at another. Queues are even forming for books during rush hour! It’s great to see similar schemes to ours here in London springing up around the world. We’re working towards this becoming a weekly round up, but to do that, we need you to tell us what you’re up to, and what interesting book and tube related stuff you’ve seen on your travels. If you have something that you’d like to share, then drop us a line at londonbookswap@gmail.com, or tweet us @booksforlondon.